ATST Solar Telescope Construction Rendering. Courtesy: Ruth Kneale, Systems Librarian. The world’s largest solar telescope will finally be built atop Haleakala, the dormant volcano that is the highest peak on the island of Maui. 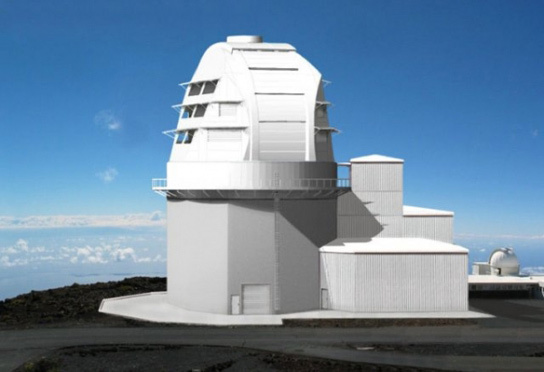 Last week, Hawaii’s Board of Land and Natural Resources issued a construction permit for the 4-meter Advanced Technology Solar Telescope (ATST). Its 43.5-meter tall enclosure will tower over the other astronomical facilities on the mountain. The project will begin next week by removing rocks and grading the 3,084-meter summit. An artist’s rendition of the Advanced Technology Solar Telescope atop Haleakala. The telescope will give astronomers the resolution to see the fine-scale structure of magnetic fields that lead to violent solar events like flares and coronal mass ejections. 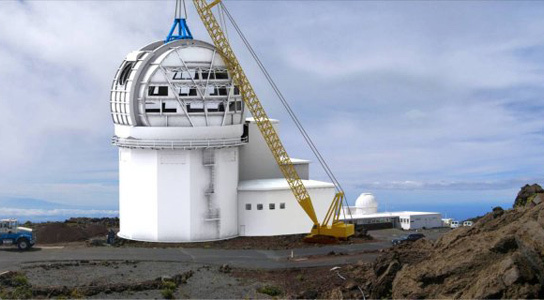 After years of environmental impact assessments, the project received a construction permit in December 2010, which was contested by the Kilakila O Haleakala, a group which claims that building the telescope would be cultural genocide. The impasse was broken when a board-appointed arbiter found the permit valid two years after it was issued. To help move forward, the project has agreed to some significant concessions. The project had to hire a cultural specialist, who has blessed the site. Construction workers will be required to take special training so that they won’t desecrate the site while they work. They will also build a shrine, adding to the two shrines built earlier by the University of Hawaii’s Institute for Astronomy. There is also a staff biologist to monitor the nesting burrows of the Hawaiian petrel (Pterodroma sandwichensis), an endangered bird. A fence will be built to keep out feral goats, which can trample the burrows. All in all, including the delays, the $298-million telescope’s price might raise by 10%. Once the telescope is completely, it will be used to gather polarized light from Sol, allowing astronomers to trace out magnetic fields lines, which could identify magnetic flux tubes (small, short-lived structures that are thought to be precursors to violent solar events). The ATST will also have to find ways to disperse some 13 kilowatts of heat. Air jets on the back of the mirror will keep it cool, and some of its silicon optics are cooled with water. The project expects the telescope to be operational in 2019. Be the first to comment on "Hawaiian Solar Observatory Granted Construction Permit"